Working On My New Website…..
As you can see, I haven’t posted to my blog in a while. I have been quite busy though, baking cakes and working on my new website. Quite excited about getting that together for the final viewing. I will be posting my newest creations, some video tutorials, recipes, etc. Don’t give up on me, please be patient and continue to follow my blog for the announcement of my new website and the wonderful things that lies in store for you, my followers. It seems to me that I get a new wealth of knowledge everyday. Whatever the case, my cake decorating has allowed me to revisit the games and toys of an earlier time, that I have completely forgotten about and also to be brought up to date on the new toys and games, not only for kids but for adults, as well. 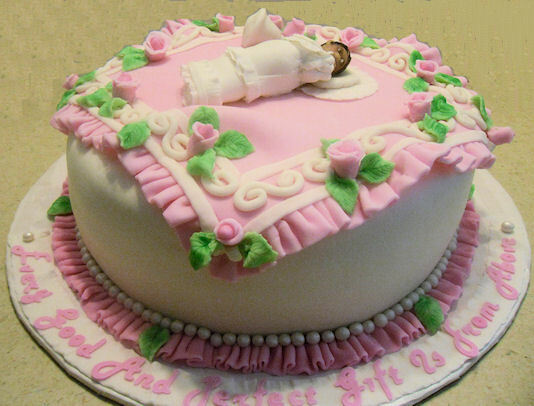 My granddaughter’s friend forwarded a picture to her asking if she thought I could make this cake. My granddaughter knows that I love challenges, and told her friend that yes, Granny can make that. In saying that, she emailed me the picture. It was a picture of what I referred to as the “ugly rabbit”. When I saw the picture, I emailed my granddaughter back and asked if this was the picture she meant to send me. I knew it was a rabbit but what was the significance behind it and why did she want that in a cake. In my opinion, it was just an unusual, ninja looking rabbit who was holding a toilet bowl plunger . Well, to save face about my ignorance, I did a little research on the internet to see what this rabbit was all about. To my surprise, it’s a Wii game called “Rayman Raving Rabbid” (spelled rabbid). Obviously, I had not heard of this game before. My customer’s friend loves to play this game and thought this would be a nice birthday cake. Now it all made sense. I find that as a cake decorator, not only does it take time and patience to bake, fill, frost, fondant or sculpt a cake, but it takes quite a bit of time to do research, as well. I thought I would put together a step-by-step tutorial showing the process, the tools I used for the structure and how I sculpted the rabbid. I hope you enjoy reading this post as much as I did creating the rabbid and seeing it come to life in cake. This is the first time I have used this particular process in creating a structure for a 3-D cake. There are some things I would do a little differently, but all-in-all, I was pleased with the outcome. Thanks for reading and Happy Sculpting! Every Good And Perfect Gift! Third cake for weekend of May 28th-29th. Christening cake for a beautiful little girl. After seeing some pictures of cakes, the Mother chose this particular cake. The cake was inspired from a talented cake artist on the internet. I do not have the artist name, but thanks for your inspiration. The cake was a lemon pound cake with buttercream filling and frosting and covered with MM fondant. 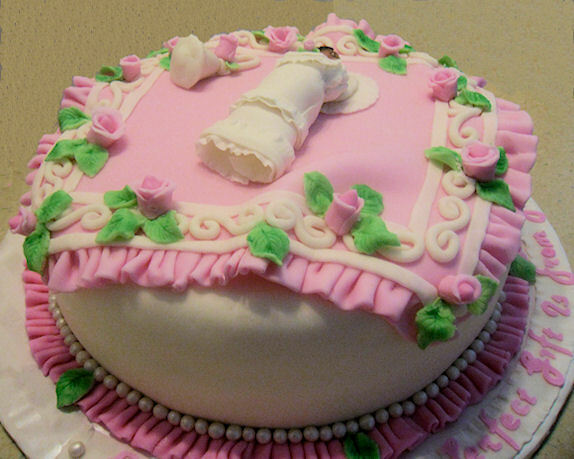 Blanket is fondant, as well as the design on the cake (swirls, roses, and leaves). 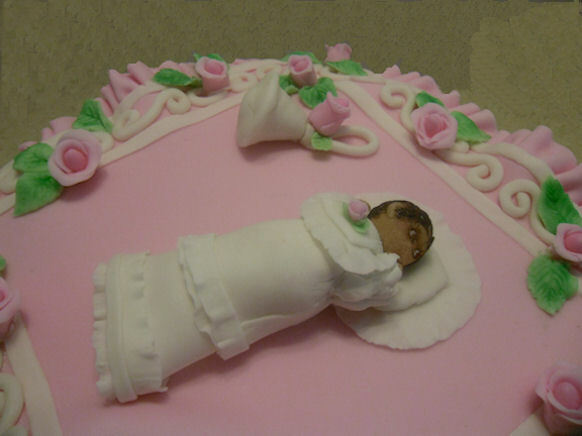 The baby, baby’s dress and rattle is made from gumpaste. The pearls on the bottom of the cake is fondant (rolled individually and pearled by my daughter). 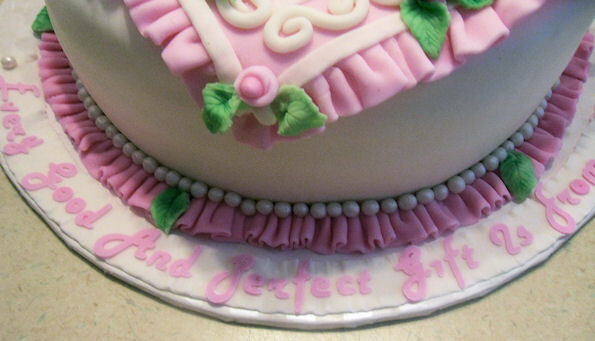 The ruffle is fondant, as well. Inscription is cut from gumpaste on cricut cake machine. I’m not sure that mine compares to the original artist, but the Mother was very pleased with the cake and that’s all that matters, isn’t it? Posted in Baptism, Christening, Blog Posts, Every Good And Perfect Gift! The second cake for the weekend of May 28th-29th. 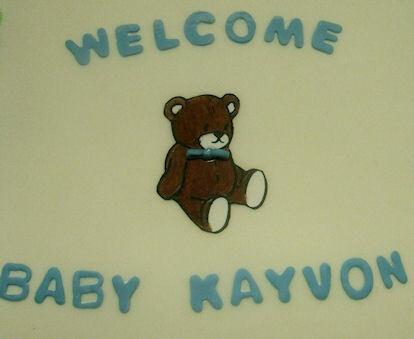 Customer requested that this cake resemble the invites that were sent for the baby shower, which were to feed 50 people. Colors were pastel blue, yellow, light lime green and white. The cake flavor is yellow with buttercream frosting covered with MMFondant. The stripes on the sleeves were cut and laid individually on top of the fondant (the white as well) so that each stripe would be level with the other. 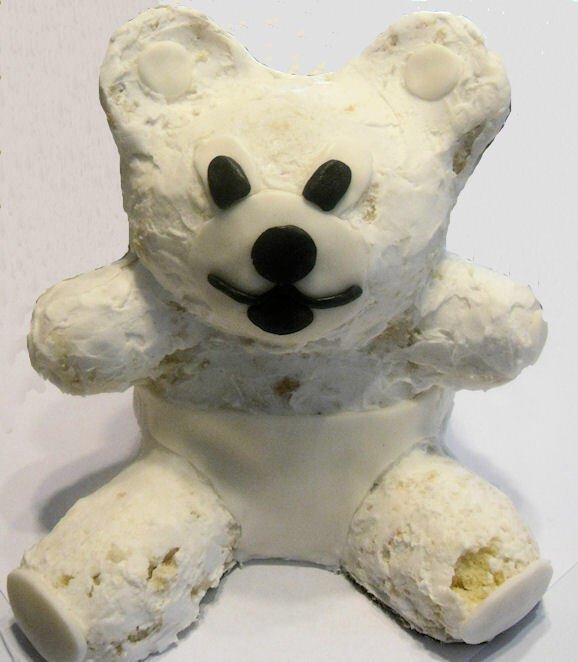 The bear was printed on edible paper and hand-painted with edible food gels. 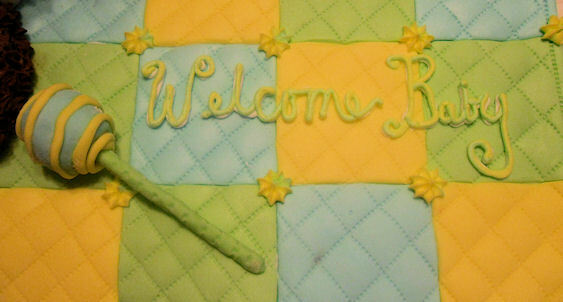 The inscription was cut from fondant as well as the stripes. Posted in Baby Showers, Blog Posts, Onesie For 50! I am of course late posting my cake pics. This is one of three (3) cakes that I made for the weekend of May 28th – 29th. 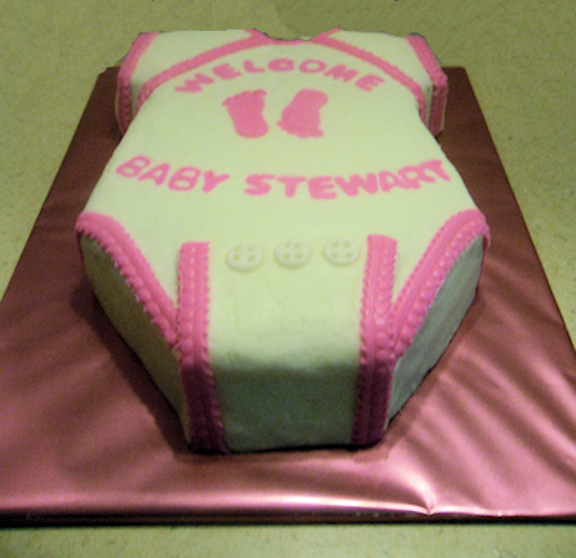 The customer chose a combination of cakes from the internet as her inspiration for the onesie. The cake is carrot with cream cheese filling and frosting. In order to get the frosting smooth, I used a crusting cream cheese, which works very well. 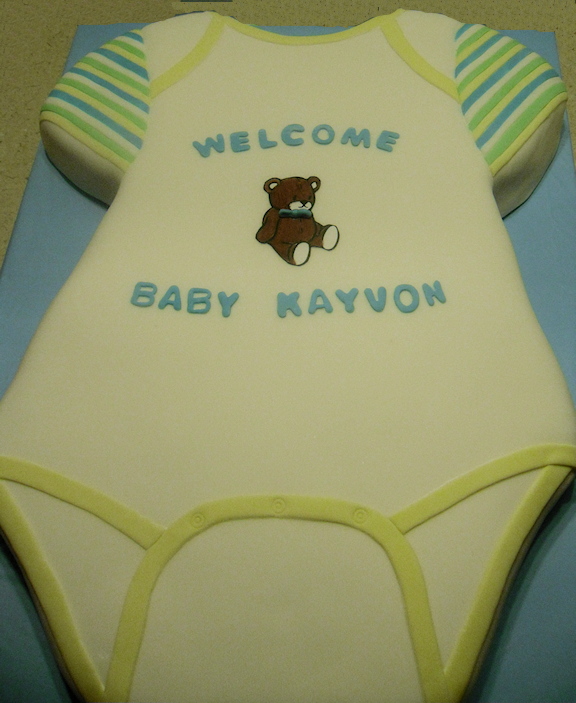 The accents around the onesie is fondant, as well as the footprints and inscription. I also made cake pops as a favor for each guest in vanilla and chocolate, wrapped individually, which I failed to take a picture of to post. How I Spent My Birthday – Work or Play? I forgot to schedule a birthday play day for myself this week. I took 3 cake orders. What was I thinking? So my day was spent making and decorating cakes. Someone mentioned on Facebook that they were waiting to see the cake that I made for myself. I didn’t have the time to even think about a cake for me. My family and closest friends surprised me by celebrating my birthday on Sunday in Newport News @ Cheddars. I love that place — I always get the Philly Cheese Steak with Fries and of course their Pain Killer drink. Lovely combination, I must say (smiles). Apprarently there was supposed to be another measuring bowl, but somehow during the course of delivery by her husband, it was broken. What difference does it make, it’s always the thought that counts. I was so excited that I forgot to take a picture. My other gifts from my sister, daughters, granddaughters, friends and my significant other included a Pandor’s charm, a Chef’s Gel Mat, more stainless steel measuring spoons, stainless steel measuring cups, silicone heat resistant mitt, gift certificate coupon to either Sur La Table or Wine and Cake Decorating Hobbies, flip flops, sundress, a set of mats for my Cricut machine (my other hobby – Screenprinting), and of course money and an investment in a van for my deliveries. On yesterday, my Son-In-Law fixed dinner for me and was delivered to me by my daughter, who then took me to Sweet Frog for dessert (non-fattening of course — before the toppings). I am so blessed to have family and friends who loves me in spite of my faults, and I have a few. Also, thanks to all of my friends on Facebook who took the time to wish me a Happy Birthday, as well. 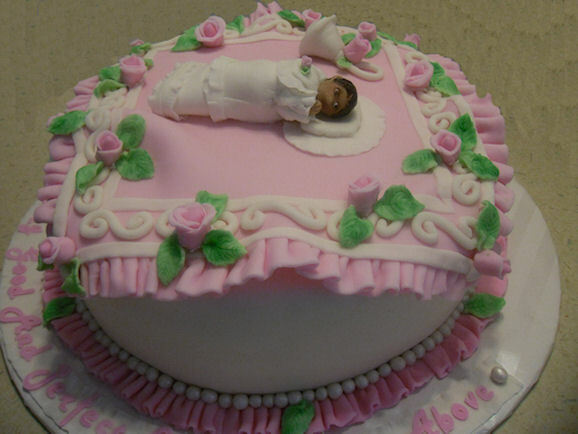 My daughter requested this cake for her God-Daughter’s baby shower celebration. The cake is 1/2 pound cake with buttercream filling and 1/2 chocolate with chocolate mocha buttercream. 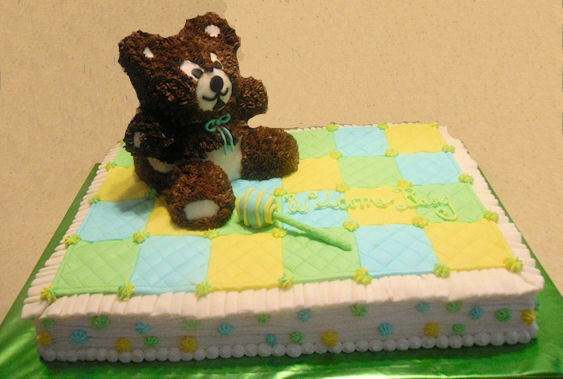 The top of the cake is covered with fondant squares. 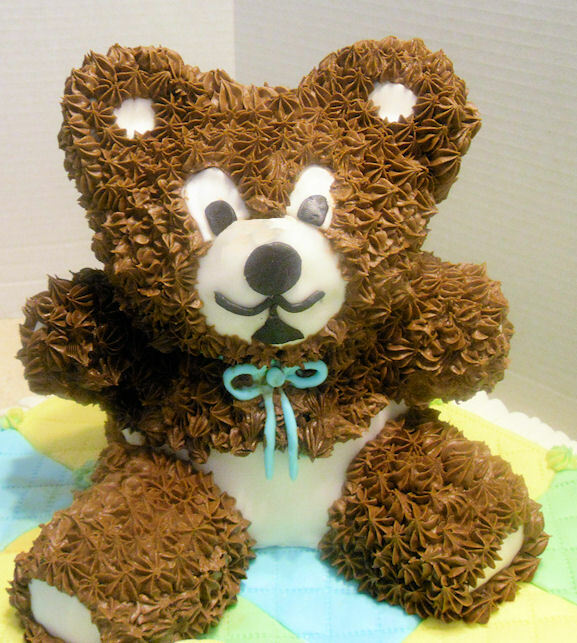 The bear is sculpted from pound cake and covered with buttercream frosting. 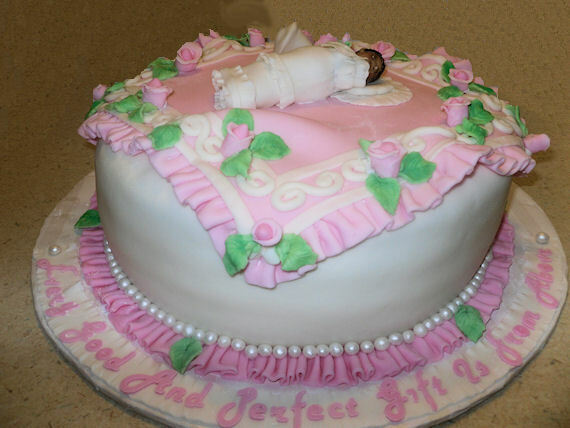 The facial features and diaper is made with fondant. Close-up picture of bear shows how the bear was sculpted and frosted. The bottom pic shows the close-up of the rattle which is a cake ball covered with fondant and the inscription: “Welcome Baby”. I had problems with the bears arms staying fixed to the body. I first sculpted the arms with the cake. 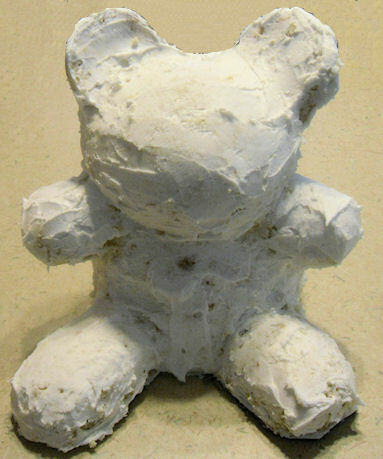 After frosting the entire bear, the right arm gave way and fell onto the fondant. Had to clean the fondant and then reattach. I made the arm the second time from a cake ball, refrosted. I thought, oh yes, I have it fixed for sure this time. Went on to doing something else. Well, guess what, I came back to look at the cake and the arm was beginning to fall again. I took the arm off and made an arm from gumpaste. Again refrosted. I cleaned everything up and retired for the night. Got up the next morning to find that the other arm had fallen off. Luckily, I had made an extra arm from gumpaste just for assurance. I attached this arm and refrosted. 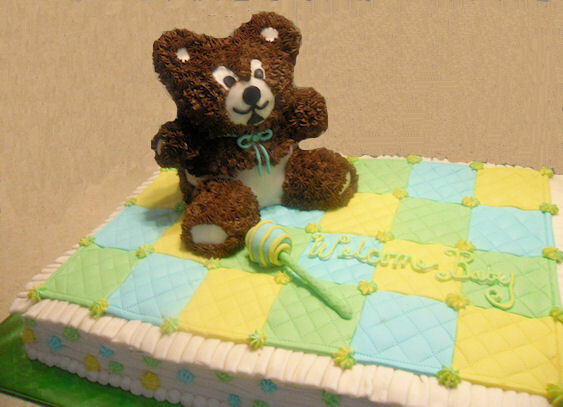 The bear and the blanket arrived safely to the baby shower and everyone enjoyed the cake, according to my daughter. A ” This Is Your Life Jazzy 60 Scrapbook Cake” that went along with the Jazzy 60 Featuring Theolonius Monk cake. Pics are printed with edible ink. Both cakes were delivered to Washington, DC. This cake was for a Jazzy ’60 surprise birthday celebration for a very special lady. She loves jazz and her daughter wanted to reflect that and some pics of her life in cake. The record player is made with all cake with the exception of the mechanics that allow the turntable to rotate. THAT’S RIGHT, ROTATE. The cake flavors are Carrot and French Vanilla with almond buttercream frosting. Customer requested this cake for a bridal shower. 1/4 — 2 layer plain pound sheet cake with buttercream filling and frosting covered with MM fondant. Rings are made from gumpaste and painted with edible gold. Rose is hand-molded from modeling chocolate. "Relay For Life" Teeth Sugar Cookies Adult Baby Bassinet Baby Blocks Baby Showers Baptism, Christening Bible and Roses Birthdays Blog Posts Bridal Showers Cake Pops Children Coleman Vineyards Cookies Cupcakes, Cake Pops/Truffles, Cookies and Decadent Desserts Every Good And Perfect Gift! Graduation Miscellaneous Cakes Mother's Day Onesie For 50! Seasonal Special Events Sports Strawberry Delight Twice The Joy! Valentine's Day Weddings and Anniversaries Welcome Little Sister!